Three days after a landmark five-set win over Western Michigan, the Northern Illinois volleyball team repeated the feat on Sunday at Millett Hall. This time, the Huskies went the distance against Miami (Ohio), winning the final two sets to pick up their third straight win (22-25, 25-16, 21-25, 25-18, 15-9), all in Mid-American Conference play. The victory marked NIU’s (17-2, 3-1 MAC) first in the first road test of the league slate since 2006, when the Huskies beat Eastern Michigan, 3-1, on Sept. 22. That year was also the last time NIU started 3-1 in conference play as well. The win did not come easily. NIU started the match slowly, hitting .176 in the first set with 11 kills, while Miami (6-11, 1-3 MAC) hit .179 with 15 kills. The Huskies trailed early, 10-7, but would rally to take an 18-16 lead to force a RedHawk timeout after a combo block by junior outside hitter Allison McGlaughlin (Morton, Ill./Morton) and freshman middle blocker Sarah Angelos (Waukegan, Ill./Waukegan). A bad set increased the lead, 19-16. However, Miami took back the momentum to end the set with a 9-3 run. The second stanza started similarly to the first as the Huskies trailed 6-2 and needed a timeout to regroup. The break woke them up and helped NIU claim a 10-7 lead after an 8-1 run that was fueled by three points from freshman outside hitter Lauren Wicinski (Geneva, Ill./Geneva), one down the line kill, one crosscourt, and an ace from the nation’s third leading server capped the run. Out of a Miami timeout, the Huskies used a pair of crosscourt putaways from sophomore outside hitter Meghan Romo (Valparaiso, Ind./Valparaiso) and slides from Angelos to help take a commanding 18-11 lead to easily knot the match. NIU turned the tide in the set by hitting .364 with 16 kills to Miami’s .258 attack percentage and 10 kills. Eight attack errors and a .122 hitting percentage were too much for the Huskies to overcome in the third set, despite taking a 5-0 lead. Both teams had 13 kills, but Miami hit .237 with four fewer errors in a set that was determined by four points. After NIU’s fast start, the RedHawks answered with a 16-8 run. Following a timeout, the Huskies were unable to regroup this time as Miami increased its lead to 19-14 and used the momentum to take a 2-1 lead in the match. In the fourth set, NIU showed a sense of urgency and was focused as it hit .419 with 14 kills and just one error. Miami hit .211 with 15 kills and seven errors. The score was tied one time at 1-1, but the Huskies cruised comfortably after that. Sophomore middle blocker Mary Kurisch (LaCrosse, Wis./West Salem) was involved in each of the last three points of the ensuing 9-4 run that gave NIU all the momentum it would need to force a fifth set. After getting a kill of the Miami block on a slide, Kurisch teamed with Romo on a block and put down another kill to force a RedHawk timeout but it would not slow NIU down. The Huskies then kept rolling in the match-deciding fifth set. They once again led for the rest of the way after a 1-1 tie. NIU ran off three straight points to cause a Miami timeout after a combo block by Hoffman and Angelos. Miami would take another timeout after Wicinski tallied three kills during a 7-3 spurt that gave the Huskies an 11-4 advantage. Following a Kurisch kill through a Miami block, Romo took over. 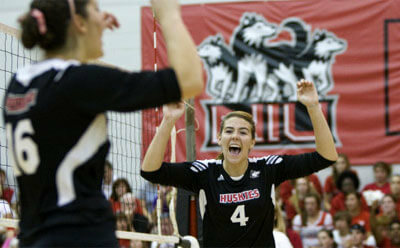 She scored NIU’s final three points, all on crosscourt kills, to put away the RedHawks. In improving to 3-0 on the road this season, and 2-0 on Sundays, the Huskies featured a well-balanced offensive attack. Wicinski led the way with 18 kills and a .342 hitting percentage. Romo put up a career-high 14 kills, adding three blocks. McGlaughlin netted 11 and 16 digs for her fourth double-double. Kurisch totaled 10 and five blocks. In running the attack, junior setter Kristin Hoffman (Batavia, Ill./Batavia) put together a solid line of 51 assists, a career-high 19 digs, five blocks, four kills, and three aces for her fourth double-double, too. On defense, senior libero Maddie Hughes (St. Charles, Ill./North) racked up 22 digs, while Angelos was the third Huskie to register five blocks on the day. The Huskies resume their three-match road trip with a contest against Central Michigan (7-9, 1-3 MAC) at 6 p.m. Friday, Oct. 8, in Mount Pleasant, Mich.